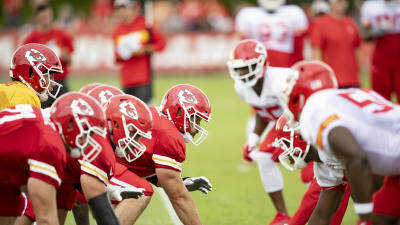 When it comes to the toughest days physically for the players at training camp every year, there might not be a day that’s more physically demanding of the players than the last day of practice in pads before the first game, which for the Chiefs, was Monday. The guys have been going at it for a couple of weeks and for more than a week in full pads. They’re tired, sore, and looking forward to Tuesday’s practice, which will begin an hour later and the guys will be in shorts. It’s a light day as the guys are preparing their bodies to be ready to go for Thursday night’s game against the Houston Texans at Arrowhead Stadium. One of the players who has put together a really good camp so far is fifth-year running back Damien Williams, who spent the past four years with the Miami Dolphins before signing with the Chiefs this offseason.